When you’re trying to reach a specific fitness goal—say, run your first half marathon—how much you need to train hinges on two main factors: the shape you’re in to start and how much time you have. But what if you just want to reduce your risk of disease and live a long, healthy life? How much do you have to exercise for that? According to the American Heart Association, 150 minutes of moderate intensity exercise or 75 minutes of vigorous activity each week can reduce your risk of everything from high blood pressure and cholesterol to cognitive decline and certain cancers. And while that might sound like a lot of time in the gym, it’s probably the same amount you’d spend watching Netflix. Plus, you don’t have to do it all at once—even ten-minute bursts count. You can also track your heart rate. Moderate intensity is when your heart rate is above 50 percent of your maximum. For example, a typical maximum heart rate for a 30-year-old is 220 minus age, or 190 beats/minute. So, 50 percent would be 95 beats/minute. Vigorous activity is when you get your heart rate above 70 percent maximum, which would be about 130 beats/minute for a 30-year-old. 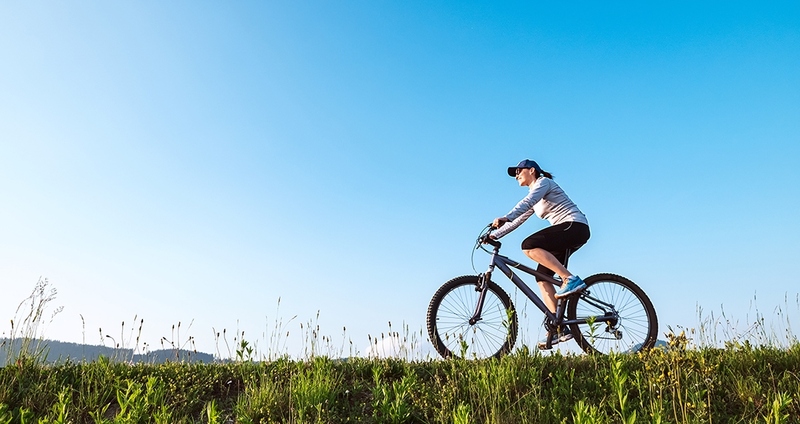 If you’re starting a new exercise program or ramping back up after some time off, moderate exercise is perfect, such as the kind of walking or biking that raises your heart rate and makes you break a sweat. But once you notice your breathing becomes softer and your heartbeat more comfortable, you can take it up a notch. Don’t fret if finding a big block of workout time is a challenge. You can break up your weekly activity into sessions as short as 10 minutes and still reap the same rewards. Just remember that 10 minutes of vigorous exercise is worth 20 minutes of moderate activity; so revving it up helps save time. Getting in your 75–150 minutes a week won’t just keep your heart healthy; it’s also a way to revitalize and renew, allowing you to succeed at what matters most in your world. But staying motivated takes finding workouts you love. Try everything from dancing to biking to power yoga. And whenever you can, ramp up the intensity to help you get the most benefit out of every minute.